I have been painting in water colours most of my life. I have also created many commercial art-works digitally “painting” them on the computer. Above is one of my first oil paintings. It was done in the summer of 2001. 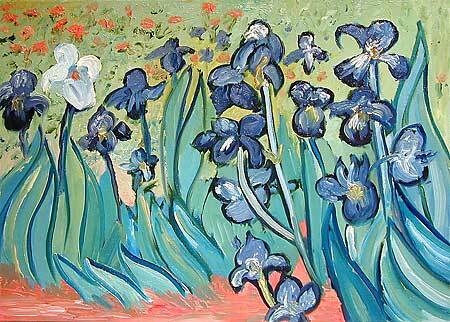 It is a loose copy of one of my favorite Vincent Van Gogh paintings “Irises.” I have always loved this painting. It reminds me of Jesus teaching his disciples. The purple irises seem to be leaning toward the single white iris, as the red faced pharisees stand in the background talking amongst themselves plotting the end of his life. I love the bold lines Vincent used. I wanted to use this “copy” to break out of my tight, frustrated attempts at oil painting that I started during the prior weeks. Those attempts all ended up half-started and later tossed. The freedom that found me during this painting, brought out a part of my creative self that had been hidden for many, many years. It took moving back to California to start painting again, but the process was sparked with this Van Gogh piece. Thank you Vincent!